Kusal Mendis and Dimuth Karunatatne shared a 191 run stand for the second wicket as Sri Lanka staged a tremendous fightback to reduce the trail to 230 runs with eight wickets in hand after India enforced follow on in the second Test in Colombo. 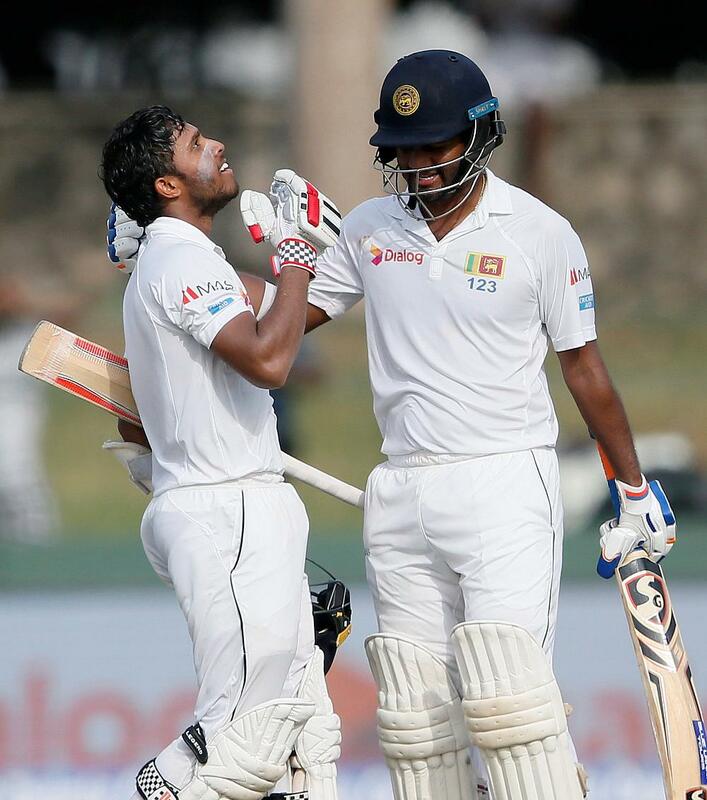 Earlier, Sri Lanka resumed their first innings with a score of 50 for two, trailing India by 572 runs. In the fifth over of the day, Ravindra Jadeja (2-84) had Dinesh Chandimal (10) caught at midwicket and an over later, Mendis (24) chipped a simple catch to mid on to give Umesh Yadav (1-12) a wicket. Niroshan Dickwella (51) broke the shackles when he smashed Ravichandran Ashwin (5-69) for a six down the ground in the 32nd over and in the next over, Angelo Mathews (26) hit two sixes off Jadeja as for the first time in the game, Sri Lanka had some momentum going. The duo brought their 50 run stand off 46 deliveries, following which Mathews was caught at leg slip to give Ashwin his third wicket. The wickets continued to tumble as Jadeja went on to castle Dhananjaya de Silva (0), which was also the 150th wicket for the left-arm spinner. Dickwella continued to attack the Indian bowlers and reached his half-century off 44 deliveries but a double strike from Mohammad Shami (2-13) in the 42nd over saw him castle both Dickwella and Rangana Herath (2). Any chance of a Sri Lanka fightback in the first innings was cut short by Ashwin, who removed both Dilruwan Perera (25) and Nuwan Pradeep (0) in quick succession to wrap up the home side for 183 runs at the end of the first session. Having a massive lead of 439 runs in the first innings, India decided to enforce the follow-on and the decision proved right as Yadav (1-29) castled Upul Tharanga (2) in the third over. Mendis (110) had a reprieve when he was dropped by Shikhar Dhawan at mid on but both him and Karunaratne (92 not out) continued to play strokes as Sri Lanka finished the second session strong at 118 for one with both the batsmen completing their respective half-centuries. The duo went severe on the Indian spinners in the final session and the runs were coming at a steady rate. Mendis was the first to reach to his century, needing 120 deliveries for it. At the run of play, Hardik Pandya (1-12) provided some respite for the visitors when he had Mendis caught behind, taken brilliantly by Wriddhiman Saha, bringing an end to a massive 191 run stand. At stumps, Sri Lanka were positioned at 209 for two, with Karunraratne eight runs short of his ton.